Since I live in the northern part of the country we have a lot of moss on our roofs our trees our rocks well you get it we have a lot of moss. Moss on the roof is unsightly and not good for your roof. The article below is to try and give you some insight to moss (hum sounds strange) and what you can do or have done to remove it and try and impede its return. If you live in a cool, wet climate, all your outdoor surfaces (including your roof) are susceptible to moss. Moss can grow on wood, concrete, clay, metal, and glass. Why is moss on the roof a problem? 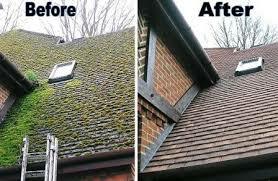 Moss retains moisture and can leave your roofing materials vulnerable to rot and structural damage. Since roof moss tends to be highly visible, it can dramatically lower the value of your home. When home buyers see a roof covered in moss, they worry about what kind of rot, mold, and other health hazards are present. What are the moss removal options? While you can scrape away most of the large chunks of moss with a long-handled brush or pressure-wash it off, you’re better off applying some type of moss-killing chemical. Physically prying living moss off your roof can tear up your roofing materials. Plus, the only way to ensure that 100 percent of the moss on your roof is gone is to apply some type of solution These are a few of the products commonly used for moss removal. Zinc Sulfate: This product is guaranteed to kill all your roof moss and prevent future moss regrowth for at least one year. After this solution is applied to your roof, the moss will shrivel up and darken in color. It is then easily removed from your roof. However, if you choose this option, you should have a professional apply it for your safety because zinc sulfate is a severe eye irritant and can be toxic in high concentrations. However, properly applied zinc sulfate can keep your roof moss-free for as many as three to seven years. Laundry Detergent: Washing your roof with laundry detergent will quickly kill the moss, causing it to turn yellow. However, it can also damage your roofing materials by causing them to dry out too quickly. Zinc Strips: This product won’t actually kill existing moss, but it can prevent moss from forming in the future. Unfortunately, installing them is costly and time-consuming. Depending on the size of your rood, you may need several hundred zinc strips to be individually nailed in place. Here is a short video showing zinc strips being installed. Bleach Solution: Bleach diluted in the correct amount of water can kill roof moss on contact and diminish the roof stains caused by moss, mildew, and algae. It is an inexpensive way to kill moss quickly. However, it does nothing to prevent moss regrowth.